CE MARK means products security, so it’s compulsory for every kind of gate. Bulgheroni turns out gates according to CE EN 14351/1 standard, so it can ensure to its customers certified products with tested performance. CE MARK means products security, so it’s compulsory for every kind of fitting. Bulgheroni turns out fittings according to CE EN 14351/1 standard, so it can ensure to its customers certified products with tested performance. Certificate issued by the Central Technical Services of the Superior Council of Public Works. 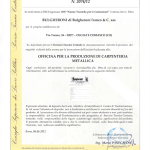 The certificate attests that Bulgheroni is in possession of the requirements of the technical standards for construction, as per Ministerial Decree of 14 January 2088. Bulgheroni is then authorized to manufacture and install structural steelwork.